Once there was a time to use simple PHP for the dynamic websites, and HTML tags are required to embed the code for some variability. But now PHP 7.0 has improved the performance along with faster execution. PHP 7.0 is much faster and efficient enough to improve the trend of web development and make it easier for the developers. Spark has replaced the trend of Hadoop with some new approach or ideas. It keeps the data in fast memory instead of necessitating the whole thing be inscribed to the distributed file system. In past development of games was not an easy thing because developer craft complete games from the scratch that take their a lot of time. But today everything has almost changed, it doesn’t mean that no one is trying to develop the games but it simply means that the developers got different efficient, reliable and reusable frameworks for the development of games that make their life easy. The trend of frameworks enables the game developers to pay more attention to making the games more interesting and dynamic. Before hiring a candidate view only their resumes is not an enough thing nowadays but for the programming candidate, the employer wants to have a glance at their code along with the coding skills. At a glance, it is easy to find out the coding style, code commenting, architecture and many other points could be checked. This is the reason it is now a trend to participate in open source projects that help the programmers to find out good jobs and employer to find the potential candidates. In previous days the vendors of cloud computing were focusing on the simplicity of cloud and not paying attention to the right machines for the right program. Today they are paying attention to the performance level of could and making it complex so they may support some of the good machines but performs well efficiently. 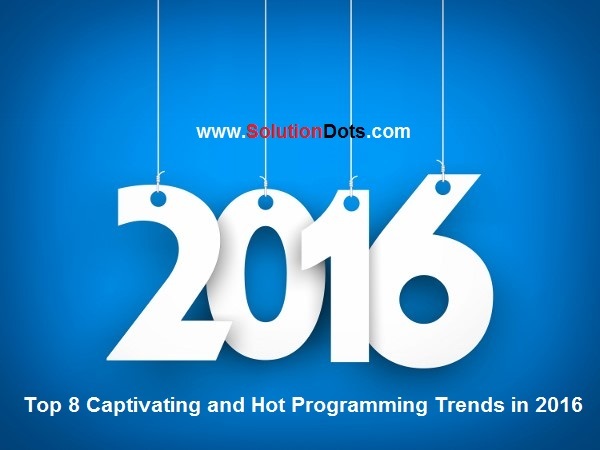 These are the top 8 captivating and hot programming trends in 2016 that changed the programming approach and enhanced the user’s experience. Programming trends constantly replaced each other along with the new technology so they will also replace by the others in coming years.